New Formula Primebiotic contains the highest quality, nutrient dense, green superfood extracts with multi-strains of synergistic live bacteria. Multi strains of bacteria are far more potent than merely supplementing with 1 or 2 strains. The probiotic process complements the inherent make up of the ingredients. Supergreens are naturally probiotic, they encourage a rapid growth of friendly bacteria. Suitable for sensitive types & those generally intolerant to nutritional supplements, especially suitable for those with poor digestion. Gradually build up to the above levels as you adapt to the product. Sensitive individuals generally need to start at lower amounts (typically 1 capsule daily). Healthier individuals can generally start at 3 capsules daily. Ideally taken just before food, but can be taken at any time if convenience dictates. Seal securely after use and store away from damp. The body is made up of living cells - it is imperative that we provide the fuel the body needs through living whole foods; this life force enables the body to use the nutrients. The man-made chemical nutrients found in most vitamins do not work. No pesticides, herbicides or other harmful chemicals are used. The product has not been genetically altered and is in a natural, live food state. Primebiotic contains the highest quality, nutrient dense, green superfood extracts, along with 9 synergistic strains of live bacteria. Multi strains of bacteria are far more potent than merely supplementing with one or two strains of bacteria. The potent mixture of superfoods, cereal grasses, micro-algae and kelp, provide many health benefits. Cereal grasses are high in chlorophyll, vitamins, protein, minerals, and unique digestive enzymes. Micro-algae contain significant amounts of lipid, protein, chlorophyll, carotenoid, vitamins, minerals and unique pigments and kelp provides all the nutrients from the ocean - nature's most complete nutrient 'store', exposing these wonderful ingredients to the probiotic process enhances their inherent ability to promote the growth and reproduction of friendly bacteria. In today's fast paced world most foods we eat are lacking in life giving nutrients. Disease is pandemic. Soils are devoid of nutrients and saturated with chemicals. Over 85,000 chemicals are currently being used worldwide. They are finding their way into our body through the foods we eat, the air we breathe and the water we drink. In the process of extracting and fracturing the elements they are rendered mostly useless. Most vitamins are synthetic and do not occur in nature. The immune system is so smart it recognises the difference between a man made bio-chemical and the natural one produced by your body cells. The body reacts in shock to the foreign substance and shuts off other parts of the immune system, particularly in the stem cells where the basic building blocks of healthy new cells are spawned. The potential for future repair of damaged cells is therefore neutralised by this approach because the organism cannot make new defensive cells for its immune system. It is vital that we obtain our nutrients from whole food sources - the superfoods in Primebiotic provide essential health giving nutrients. Oat Grass Provides vitamin C, beta-carotene, vitamin K, folic acid, calcium, iron, protein, and B vitamins. Live Bacteria Extensive bacteria replace missing flora breaking down the complex proteins, carbohydrates and fats to more easily assimilable amino acids, fatty acids and simple sugars. For centuries, cultured and fermented foods processed with micro-organisms have been an important part of man’s diet, as we have moved towards more processed foods in the diet, cultured foods are lacking in many people’s day to day nutrition. Furthermore, the use of antibiotics, fizzy drinks, preservatives, chlorine, fluorides, sugars and alcohol all kill the friendly bacteria in the intestinal tract. In recent years, more and more products have come on the market promoting the benefits of "friendly bacteria”, but by and large, these are processed products, often with high levels of sugar and are far from their natural state. Good digestion is central to improving health. It is vital that we eliminate bad bacteria from the intestinal tract, and keep the whole internal terrain more balanced by nourishing the friendly bacteria that promote good health. Digestion is the most energy consuming function of the body - it takes more energy than running, swimming or bike riding. Beneficial bacteria provide live enzymes which encourage foods to be digested and assimilated effectively. Enzymes are essential for health and vitality; when these enzymes are depleted, the body becomes diseased. Maintaining a constant living enzyme supply through proper food intake ensures good health and vitality. 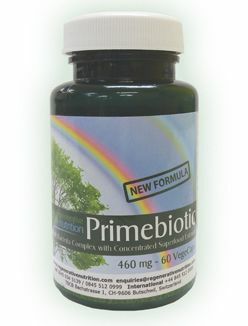 Primebiotic promotes the healthy environment in the intestinal tract that is at the base of good health. Extensive lactobacillus bacteria are present to replace and replenish the missing flora that is necessary for digestion. These organisms digest the superfoods, breaking down the complex proteins, carbohydrates and fats to more easily assimilated amino acids, fatty acids and simple sugars. This leads to more efficient assimilation and utilisation of these nutrients and a reduced burden on the digestive tract. The action of the culture organisms makes the minerals in cultured foods more readily available to the body. This makes this product especially pertinent for persons with food intolerances, bowel disorders and poor digestive assimilation. Also, due to the action of the micro-organisms that digest the greens and other foods, the final product is less stimulating than if these foods were taken in a raw state. This means that this product is suitable for sensitive and delicate types, including the young and old. Chlorophyll is the 'green blood' of all plant life and has a chemical structure very similar to haemoglobin, our own red blood molecules. Chlorophyll carries oxygen around the blood supply and builds the red blood cell count. It cleanses and purifies the blood stream, kidneys, liver and bowel. Scientists and medical professionals have long recognised the importance of chlorophyll in the diet as a bowel cleansing agent and a natural deodorant, and topically as a wound-healing accelerator. Chlorophyll is a concentrated sun energy that can be assimilated and released into the cell structure of the body, cleansing the body of toxins, energising the immune system, strengthening cell membranes and boosting natural energy. It is vital that the body has the necessary nutrients to eliminate toxins from the body. Chlorophyll detoxifies the human body. If the body cannot rid itself of toxic agents they will be stored in the tissues and cause all manner of harm to the body and manifest in disease. Cereal Grasses, Spirulina, Dunaliella salina, Kelp and Chlorella are all excellent sources of chlorophyll. Most people think that to obtain protein you must eat protein, the situation is a little more complex. All proteins the body needs are assembled from amino acids. Our body requires amino acids in their natural form, (not synthetic) in order that all bodily metabolic functions can operate properly. There are 20 different amino acids, all are essential. Fourteen can be produced, by the body, eight can only be derived from food and thereby are called the eight essential amino acids. Amino Acids boost the immune system, detoxify the liver, (which is under constant attack form the moment you are born to the moment you die) and provide the food your brain needs. Fatty Acids are essential for our cells to operate normally and stay alive. Passage of necessary minerals and molecules are regulated by cell membranes. When your cell membranes are healthy they stop harmful chemicals, parasites, moulds, viruses and other dangerous organisms like bacteria from entering into the cell. Chemical receptor sites for hormones are also maintained in the cells. Hormones are the body's crucial messengers. Fatty Acids are part of numerous chemical processes in the body and are used as building blocks for certain hormones. Carotenes like Beta Carotene have been shown to protect against a highly energized free radical form of oxygen called Super Oxide in addition to a broad spectrum of free radicals. Carotenes are your front line anti-oxidant defenders. There are over 600 toxic compounds found in the urban air. They all have the potential of introducing free radicals in the body. When you breath in air, it does not all stay in the lungs. It is absorbed into the blood stream and circulated through the body. Carotenes are designed by nature to act as protector substances against the formation of free radicals. They also prevent already pre-formed free radicals from being absorbed from the outside environment that can damage the internal environment. Carotene pigments work as free radical quenchers by squelching free radicals before they can harm the sensitive RNA messenger which replicates the DNA code signal which in turn creates our new cells. A free radical is an atom or molecule, which possesses an unpaired electron and is therefore unstable. Each day, free radicals attack the DNA in a single cell about 10,000 times. Free radicals attack cellular membranes sometimes causing severe damage. They can cause red blood cells to burst by rupturing their cellular membranes. Research has linked free radical damage to premature aging and virtually every degenerative disease known. Nature has provided plants with this type of protective pigment (carotenes), because the sun's radiation raises the potential of all the photosynthetic systems to produce extra electrons and too many electrons will kill the plants. Our happiness or sorrow lies in our knowledge of the way our own body defends us against debilitating disease such as cancer and those bacteria and viral infections which have the potential power to bankrupt the pocketbook as well as the health and joy of our life span. Most of us take our immune system for granted and do not seek to discover how we can energize it until we get sick and then we develop real motivation to find a cure for our problem. If we can clean up the cell environment and trigger the immune defence system we can find a natural way to deal with all disease. In other words we must use preventative measures. Disease is a breakdown of the cells immune defence system. Change the potential within the system and the external condition is also changed. Know how is the key - knowing how our system works, how to obtain stress relieving bio-chemicals from our food and understanding which elements boost and assist our immune system. Primebiotic is full of nutrients that assist the immune system. Hyperlipemia is the syndrome where excessive lipids such as cholesterol and net fat are found in the blood, which contributes to clogged arteries. Hyperlipemia could cause arteriosclerosis, cardiac infarction, and cerebral infarction. More than 60% of people 50 years or older in Japan are suffering from hyperlipemia due to changes in lifestyle (more meat and sugar, less physical exercise). Eighty percent of cholesterol is produced by the liver and provides benefit to the body. Bile acid produced from cholesterol assists digestion and absorption by binding excessive lipids in the intestine. Intestinal micro organisms (beneficial bacteria) assist with metabolism, absorption, and excretion in the intestine. The use of cholesterol in the body depends upon the condition of intestinal microbial flora (the balance of beneficial vs. harmful organisms). Beneficial bacteria turn the cholesterol into useful substances, which, in turn, lowers the cholesterol level in the blood. It is important for people who are suffering from hyperlipemia to enhance their beneficial intestinal bacteria by daily intake.